Understanding the TRUE costs of living in Colorado for diverse family formation is critical to our work. With the support of The Women's Foundation of Colorado, WAGES grantee Colorado Center on Law and Policy (CCLP) released the sixth edition of the Self-Sufficiency Standard and accompanying reports Overlook and Undercounted and Exploring Economic Security Pathways in Colorado, funded by The M&I Charitable Giving Fund, a donor-advised fund held at WFCO. In addition, it’s critical to our grantmaking and public policy work that we understand the best pathways to move women from economic self-sufficiency to security. That’s why The M&I Charitable Giving Fund, a donor-advised fund held at The Women’s Foundation, funded Exploring Economic Security Pathways in Colorado, a new report for our state in 2018, that builds upon the Standard. Here are the key facts we think you should know, whether as a community member, policymaker, media member, or researcher. Earn enough pay for the basic expenses of daily life. 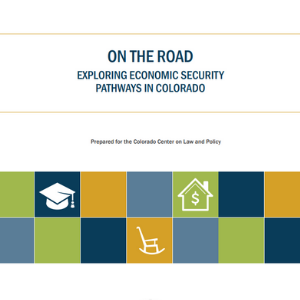 Pursue at least one of the following economic security pathways: post-secondary education, improved housing and home ownership, and savings for retirement. All stakeholders – employers, the government, and the community – must play a role in helping to achieve economic security for all. The data in these reports represent the lives of real Coloradans trying to make their way out of some way in our community. To discover how members of your community are faring, join us at regional events in the coming months. We will take this data on the road with CCLP, offering localized presentations in Boulder, Colorado Springs, Denver, Northern Colorado, Pueblo, and Vail Valley.